CILB Executive Director stated throughout the meetings that the department will no longer mail new licenses. Instead, the department has implemented a new process that will allow licensees to print their licenses by logging into their secure on-line account. This will cut 7-10 business days off the process. This same process will allow licensees to renew on-line as well. Question was asked if one license is disciplined, are all of the qualifier’s licenses affected. The answer was yes. There was one applicant that stated that he would be paid by 1099 by the new business. He was denied. The committee reviewed proposed changes to 61G4-15.0021, Business Organizations. The committee reviewed draft language that will revise requirements for applicants seeking to qualify additional business entities. The proposed change would strike the 50% rule for ownership (present and proposed business organizations), add that applicants with 20% or greater ownership of the proposed business organization will not have to appear before the board if the applicant otherwise qualifies for approval. In addition, the board delegates authority to the Executive Director and/or Board Chair to waive mandatory appearance requirements where applicants are in compliance with Rule 61G4-15.0024, F.A.C. Lastly, the proposed change would require any applicant seeking to qualify three (3) or more business organizations, regardless of percent of ownership, to appear before the board. The committee approved the language. A petition to amend rule 61G4-15.015, Certification of Specialty Structure Contractors, was presented by Joe Belcher and John Meyer, Aluminum Association of Florida (AAF). Many AAF members report losing work to unlicensed contractors advertising and contracting to do rescreening of screen enclosures at a lower bid. In most cases, it is reported that the unlicensed persons rescreening screen enclosures also replace structural members, add structural members such as bracing and remove and replace screws, fasteners, anchor bolts, shear cables and other structural elements. The AAF has brought this to the attention of various building departments, and frequently the response is that rescreening is not included in the Scope of work of Rule Chapter 61G4-015, F.A.C. ; and therefore, the building department cannot regulate the activity. The committee denied the request to open the rules as the scope of work is already defined in 61G4-15.015(2)(a). 61G4-18.001, Continuing Education – The revised rule will update the language to include the most recent exceptions from the 2017 Florida Building Code into the rule by reference. The amended rule will take effect May 28, 2018. The National Association of State Contractors Licensing Agencies (NASCLA) made a presentation to the board on their accredited examination program for commercial general and building contractors. They were seeking endorsement from the board for applicants who have successful passed their examinations as equivalent to Florida’s general contractor’s trade knowledge portion. The first NASCLA exam was given in 2009. Advantages of the NASCLA Exams are they promote mobility and possibly saving money in exam development. Six (6) states currently administer the NASCLA exam. Sixteen (16) states accept NASCLA exam. The Building Codes portion of NASCLA’s exam uses the ICC codes. State specific codes can be added as an addendum or new part. Florida could have a supplemental exam for building codes. 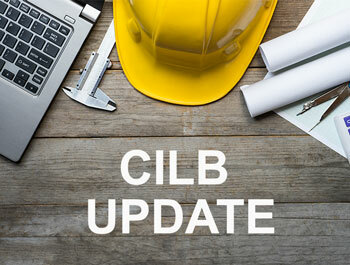 Former CILB Board Member Bob Moody addressed the board and suggested that out of state contractors who passed the NASCLA exam could also be required to take a continuing education course on the Florida Building Codes before endorsement is accepted. A motion was approved to appoint a five-member committee at the board chair’s discretion to develop a draft rule to accept endorsement of NASCLA’s exam for the trade portion for general, building and residential contractors.